A rare three-year, two-way varsity performer for legendary Hall of Fame Football Coach Ray Riddick, Bruce Desmond was an offensive and defensive catalyst for the Red and Gray gridiron juggernaut during that golden era of Lowell High School Football. 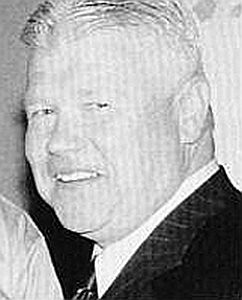 Bruce competed in both Indoor and Outdoor Track for Lowell, throwing the shot put and the discus, but it was on the football field that he made his mark, breaking into the lineup during his sophomore season (1969) as Lowell compiled a record of 6-3. Bruce’s role expanded considerably during his junior year (1970), starting at fullback on offense and linebacker on defense. Used primarily as a blocking back on offense, Bruce helped open the holes as running backs Kevin Crocker and Greg Farris combined for almost 2,000 yards rushing between them. Despite limited opportunities to carry the ball (32), Bruce averaged over 6 yards per carry and scored 3 touchdowns. He scored 2 of those TD’s in Lowell’s 19-0 victory over Haverhill. In the season’s climactic season-ending 33-6 victory over arch-rival Lawrence, Bruce provided a harbinger of things to come as he scored on a 32-yard run and recovered 2 fumbles as the Red and Gray completed a perfect 9-0 season and were named Eastern Mass Class A State Co-Champions. Bruce’s offensive and defensive contributions to Lowell’s season were major factors in the Raiders’ success. With only one returning offensive starter from the 1970 Class A State Championship team, optimism for Bruce’s senior season (1971) was not high. When Lowell lost their two initial contests by a combined score of 46-0, many felt that their worst fears about the campaign were being realized. Sometimes, a season can turn around on one moment or one play. That was the case here, LHS trailed Nashua 8-0 in the opening period of game 3. At that point Bruce, a team Tri-Captain, made a jarring tackle, causing a fumble that he recovered. Lowell’s offense took control of the ball and marched 59 yards for a touchdown. Bruce carried the ball 9 times and accounted for 48 of the 59 yards. Bruce ended the drive by scoring on a two-yard TD run. After carrying the ball only five times combined in LHS’s first two games, Bruce rushed 19 times for 94 yards versus Nashua. He became the Raiders’ go-to guy from that point on. Lowell eventually won that contest 20-14, effectively turning its season around. The Red and Gray never looked back, running off seven consecutive victories to complete a 7-2 season. Coaches pointed to that fumble recovery and TD march as a turning point in the game and the season. Continuing his stellar play on both sides of the ball, Bruce turned in many outstanding performances during the season as he virtually never came off the field. He recorded 20 tackles against Weymouth, 2nd highest total in school history to that point. Bruce scored 3 TD’s in a 27-13 win over Haverhill, rushing for 120 yards. He finished the season and his LHS football career by winning the James Scondras Memorial Award as the game’s outstanding player, as Lowell dominated Lawrence 19-0. He scored a touchdown and also played his usual strong defensive game from his linebacker position. Bruce led Lowell for the season with 7 TD’s while contributing so many intangibles through his leadership. At the conclusion of the season, Bruce was recognized for his stellar play by being named as an All-Scholastic selection by both the Boston Herald and the Waltham News-Tribune.